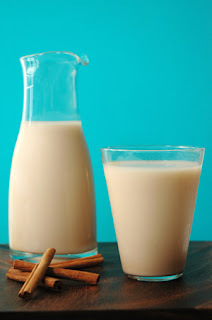 Spanish Blog: How to make horchata (a rice drink)? Horchata is a rice drink serve in many Latinamerican countries. It is delicious and refreshing. Cover the rice and the cinnamon with water. The next day blend the rice, cinnamon, peanuts and water. Add sugar. Serve over ice.